It isn’t always easy to find time and inspiration for the evening meal when both parents are working, and then you set the plate of food down in front of your children and they turn their nose up at it! Even when one parent stays at home to look after the children, and has prepared a healthy balanced meal, yep, your kids poke at it with a fork and go “eugh what is this! !” It is easy to lose motivation. Getting children to eat a maximum of different foods from a young age is a great way to start. I mentioned the wonderful ‘Babycook’ to some friends who looked at me with wide eyes and said “a baby what?” I was lucky to be introduced to this French lifesaver by my French speaking friends. It is a steamer cooker blender all in one, made by the French company Béaba. It is not expensive, around 100 euro for a new one, and it is fast. It defrosts and reheats, and lets you make a complete meal for your baby or toddler. Their website has plenty of recipes for inspiration, both sweet and savoury. I used it to make lunches with pasta/potato, meat/fish and vegetables, cooked and blended all in the one pot in 15 minutes. Switch it back on in the afternoon for fruit and vegetable purees – a great versatile tool. You certainly get your money’s worth! Getting children involved with food from as early as possible, with food preparation or just playing with some of the ingredients whilst you prepare, can help take the stress away from meal times. The process of being involved makes it easier for them to enjoy the result rather than placing a plate in front of a rebellious toddler who has decided not to want what you want them to have. My girls have been peeling and chopping vegetables and fruit from a very young age. 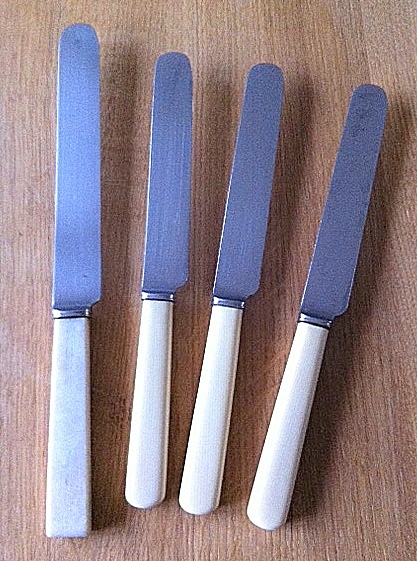 I had the luck to have some of my Nan’s old fashioned dinner knives, which can cut really well but have a round end and are easy to hold and not heavy. Children learn about food through observation and experience, so what we do sets a precedent for our little ones. A good rainy day activity is to get your children to make a “fruit/veg in season” wheel, so that they can understand what they should eat and when. This also helps them to see the variety of fruit and veg out there. Get children involved by growing their own tomatoes, or any other fruit or vegetable. My friend’s son grows great chilies! Take them fruit picking and then let them chop up the fruit to preserve, or they can hand rub the crumble which means they can prepare a whole desert by themselves even from a very early age. Crumble: 200 g plain flour, 110 g golden sugar, 110 g cold butter cut into cubes – you can add chopped nuts or rolled oats and any leftover can be frozen. As children get older, it is good to let them have some autonomy in the kitchen. As hard as it is, just stand back and let them get on with it. They have to learn to clean up as well! Having their own note book to write down their favourite recipes not only helps their autonomy, but works on their handwriting and spelling at the same time. My children started off preparing breakfast, then their own sandwiches and picnics as well as making fairy cakes, and then a three course dinner for me and my husband, waitress service included! I remember making these when I was little and them going straight from the pan to plate, getting a lick of salty butter and disappearing in the blink of an eye. Put flour, sugar and salt into a bowl. Make a well in the middle, add egg(s) and mix with teeny bit of milk until smooth, then and only then, gradually add the remaining milk. Heat a frying pan (medium heat) with a little rapeseed or sunflower oil, use a piece of kitchen roll to evenly distribute and mop up any excess. Test the heat of the pan by dropping a tsp of the mixture into the pan. 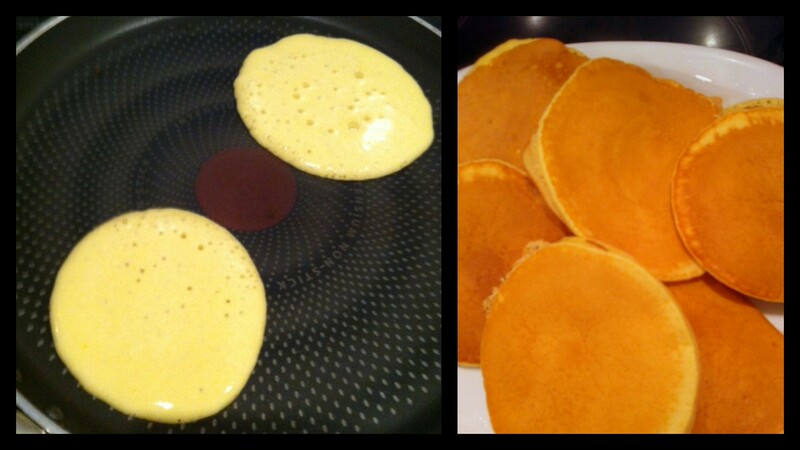 Drop tablespoons of the mixture into the pan and flip the pancakes with a spatula when you see bubbles on top. They will be finished in seconds. Your pancakes should be golden brown. Best eaten on the same day.